I started this blog New Year’s Eve 2007, a little over a year after my grandfather, Larry Polite, died about six weeks short of his 98th birthday. As we moved my grandmother, Gladys Polite (or Marmsie as we and many others knew her), out of their apartment and into assisted living we needed to move a lot of the things they collected and kept through the years to new homes. My initial interest in just uncovering a fresh look at the things they held dear over the years turned into an effort to show her it was worth saving it all. She had always been concerned about the things she saved and who would want them. Early on I convinced her that there are people out there that are interested in such things, no matter how small or seemingly insignificant, and they will find them if we put them ‘out there’. Multiple explanations of ‘the Internet’ and ‘the World Wide Web’ were met with the same blank stares that my job descriptions garnered through the years. “Honey, you know I don’t know what you are talking about,” she would often say with the slightest of smiles. As I started going through their things that marked their history with The Guernsey Cow and Exton, PA and Chester County in general, I would send her printed copies of the blog posts and the comments that people left. I would tell her how many people visited the blog, how far away people visited. What pleased her most is that people remembered and were actively out there searching for information about The Guernsey Cow and the history of Exton, PA. I think it also pleased her that saving “all this stuff” had been worth it. In 2009, I launched another blog dedicated to her “stuff”. The Amercian Gothic Parodies blog is a showcase of her collection of parodies of the Grant Wood classic. When they were living in Exton, my grandmother had a wall in the basement dedicated to magazine covers, ads, greeting cards and more that used parodies of American Gothic. She continued to collect them on her own and from friends and family that knew of her obsession. In December 2009, a student at The Arts University College at Bournemouth, England got in touch with me and asked permission to use the collection in her dissertation on Andrew Wyeth’s Christina’s World and Grant Wood’s American Gothic. She also asked some interview questions of my grandmother that I relayed. My grandmother was shocked and thrilled that her collection would spark the interest of a college student in England and that she would be included in it as well. 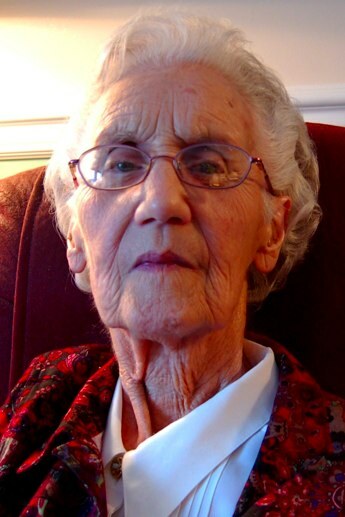 Last weekend, my grandmother, Gladys Polite, passed away at the age of 95. I have fresh boxes of the things she left behind to go with the many boxes that I’ve had for several years now. I’m actively digitizing things as I can and will share fresh material from The Guernsey Cow as I get to them. Know that your visits, your comments, your memories of The Guernsey Cow and Exton pleased her. Thanks for sharing here and on The Guernsey Cow Facebook page. 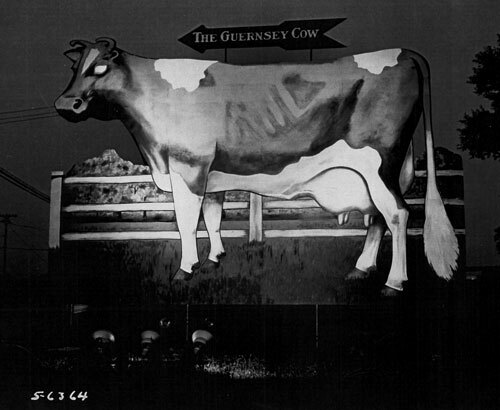 I’ve been meaning for a long time to post a photo of the actual Guernsey Cow sign since, for many (or most), it is what defined The Guernsey Cow. I actually have very few photos of the famous sign. 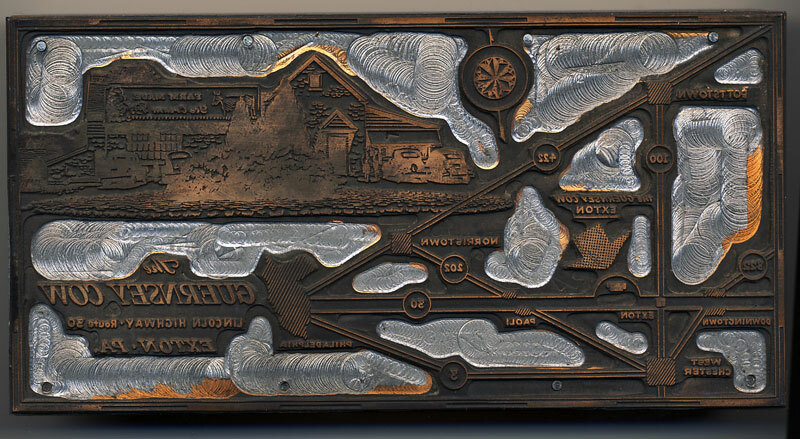 While it was still known as The Exton Dairy Grille, in 1927, Frank B. Foster, the owner of the dairy business that my grandfather, Ilario Polite leased, had a large cow billboard across the street. Soon after, though, a real estate man convinced Mr. Foster to sell the land on that side of the road. As a result of the sale, they needed to take the sign down. 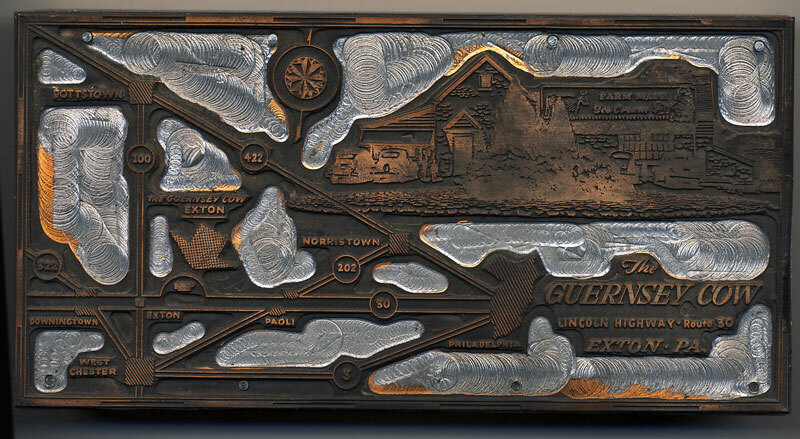 On this 1941 Exton Dairy Grille wallet calendar made by Whitehead & Hoag it reads: “At the Sign of the Guernsey Cow.” There was a smaller billboard of a cow by the entrance of the Dairy Grille parking lot in the intervening years. 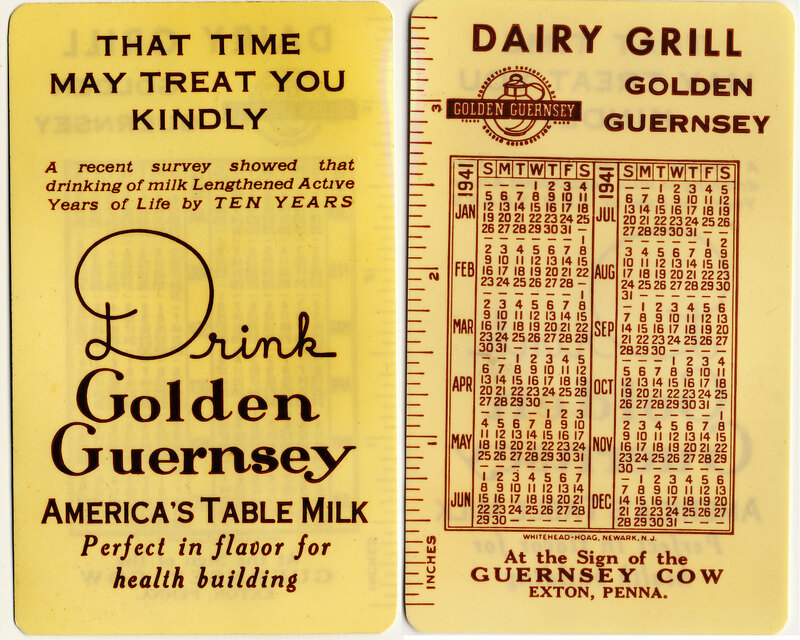 Later, in the 1940s, Polite changed the name from The Exton Dairy Grille to The Guernsey Cow. In 1983 he told a story about repeat customers that came from far away that would always tell him on their visit: “I don’t know why you call this place the Dairy Grille — when we come here, we say ‘We’re going to see The Cow.’ You ought to call it that.” And so he did. In the 1940s, Polite was able to purchase the land across the street where the sign once stood. On the day World War II ended, he called Pottstown sign-maker, Harry Reed, about constructing a billboard of a giant cow on that land. While he had owned the land for some years, due to war-time rationing of steel and other materials he had been forced to hold off on building The Cow anew. 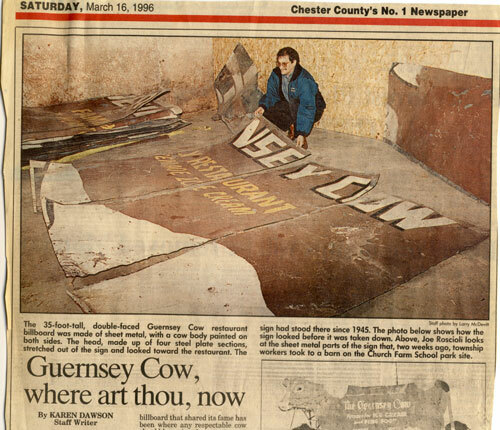 The sign itself was about 35 feet tall and 48 feet long and actually consisted of 2 giant cows in a wedge form to give it depth and the best visibility when traveling from both the East and West on the Lincoln Highway. Sometime after the billboard construction, the Pennsylvania Department of Highways (later PennDOT) demanded that the Cow billboard be moved back from the road because the head of the cow stuck out above highway property. A company from Lansdale was brought in to discuss moving the Cow sign and the owner and some engineers came to Exton and “stood around and did a lot of talking.” They proposed dismantling the sign, then re-assembling it further back from the road and repainting it. Polite didn’t like the engineers’ idea. He wanted to bring a crane in to lift it off its three supports and move it back from the road. They wanted $2500, but ever the haggler, he got them down to $1500. Today where the sign once stood, a regular billboard stands advertising health insurance, I think. What’s left of the cow lies in pieces (and headless — the head stolen in 1985 before the sign was dismantled) in a West Whiteland township barn. I am hoping to visit it and get some photos soon. The article and photo below appeared in The Daily Local News March 16, 1996. 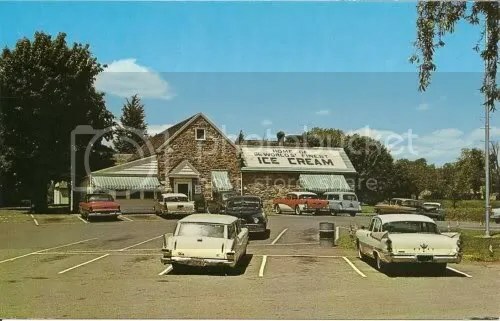 “The Cow,” as it was affectionately dubbed by the students, served as one of the few off-campus attractions in the less-sophisticated ’40s and ’50s, a respite after a long week of classes and research papers, a place to relax, luxuriate, and enjoy a dish of incredible ice cream. Piling into a car for a drive to “The Cow” became, over the years, a veritable tradition for Immaculata students until its closing in 1985. If you have photos of The Cow you’d like to share, you can email them to me at busboy@TheGuernseyCow.com@ . This sign is one of my favorite relics of The Guernsey Cow. 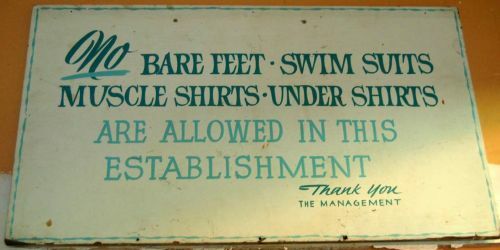 Hand-lettered on a stiff board, it is a sign of times gone by. I love the use of four different typefaces and the decorative border. 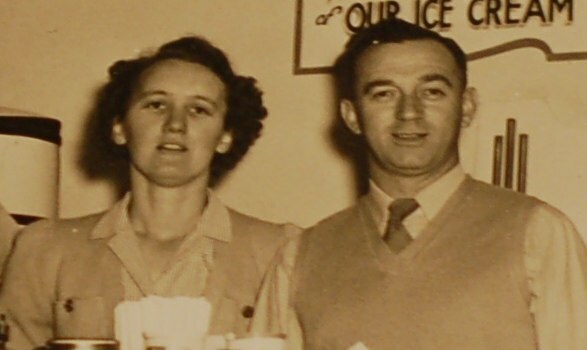 More than that, it speaks to the kind of business my grandfather wanted to run and represent. I can’t imagine the run-ins he might have with customers were he operating the business today. This late 1950’s postcard of The Guernsey Cow is open for bids on eBay right now. The cars really give the postcard it’s ‘classic’ feel along with the 50 gallon drum trash can and oil stains in the parking spots. These rubber squeeze change purses seemed to be all the rage back in the 1970’s when my brothers, sister, and I were growing up. Seemed like we were always getting new ones from various places. I don’t recall ever seeing this model. I think we found it in my grandfather’s desk last year. Author guernseycowPosted on February 21, 2008 December 29, 2016 Categories memorabiliaTags 1970s, coins, purseLeave a comment on Memorabilia: Spare a dime?